Chocolate Pudding was one of my first posts back in 2011, way before I knew a thing or two about photography or videos. 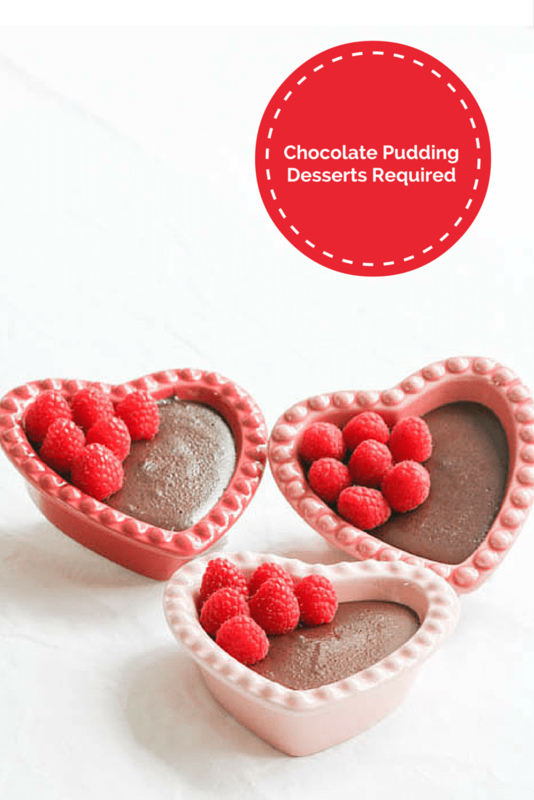 This is one of my favorite recipes and I, therefore, simply had to update it with new pictures and a video to show you just how easy Chocolate Pudding is to make. Think outside the box when it comes to serving your pudding. Cups, saucers, ramekins and martini glasses are just as beautiful as a crystal bowl! Confession time. I hate sifting…ANYTHING. I think I have tried just about every kind of sifter out there; plastic and metal, hand crank and pull the handles together types. The sound that the metal to metal makes while sifting and/or the dust that flies and/or the itty bitty bits that I can’t get rid of when I try to clean the darn thing do me in. Many years ago, there was not really a choice for most recipes. The flour that I bought was always clumped together and that was not acceptable. Then I discovered King Arthur Flour (KA) and my troubles went away. I contacted KA to find out if there was a reason for this and they were very helpful. KA flour has less clumping because their flours are of a very fine particle size and they are triple sifted at the mill before packaging, so any particulates are removed then. KA is pricier than the other flours I used to work with, but since my hatred of sifting runs deep and the flour feels so silky smooth and never fails me, it is worth the money in my book. I know some of you are thinking that there are many recipes that call for sifting and I must be an idiot not to do that. You are probably right on both counts, but my cakes always turnout just fine, so I stick by my no-sifting rule. I have turned to whisking dry ingredients together when a recipe calls for sifting. Is it the same thing? Absolutely not. Will I ever earn a living as a pastry chef? Absolutely not. Will I continue to bake and have incredibly delicious desserts? You betcha! Are you wondering why I go on and on about sifting for a recipe that does not even have flour in it? It is because cocoa powder is also one of those pesky ingredients that is often times a tad clumpy and bumpy and needs a bit of caressing to smooth out. For itty bitty amounts (1 tablespoon or smaller,) I used to spoon the cocoa into a small strainer and stir a spoon through it until all the cocoa passed through the strainer. After an intense cocoa ingredient filled baking period of time, I decided I was tired of this method of straining, too. In this incredibly decadent Chocolate Pudding, the dry ingredients get whisked together before the ½ and ½ is added. Once the cooking starts, and I see little bumps of cocoa floating around, I simply mush them against the side of the pan and they melt away. It does not get much easier than that. Of course, the option to sift the cocoa and/or all of the dry ingredients together is always available to those who want to make sure they do not have any bumps in their Chocolate Pudding. For me, I don’t think much about them one way or the other as the pudding is so incredibly rich and creamy that a bump would have to be the size of a golf ball to actually get my attention to switch from Ahhhhh to Yuck. I have never taken a spoonful of Chocolate Pudding and eaten a lump of cocoa. Perhaps because this has not happened, it has given me a false sense of confidence that cocoa can be mushed into a hot ingredient and forced to behave. Until this no longer happens, I will continue to buck the sifting trend and hang on to my whisk. Author: Adapted from a source I can't remember. Combine the sugar, cocoa, cornstarch and salt together in a medium size saucepan and whisk until well blended. Gradually stir in the half and half. This will first form a paste and then turn into a smooth liquid. Add the chocolate chips and vanilla. Stirring constantly, cook the mixture over medium heat until it is thick and creamy, about 10 minutes. Immediately transfer to a 1½ quart bowl. Cool on a wire rack and then refrigerate until cold. Just before serving, beat the whipping cream and confectioners sugar in a large mixing bowl until peaks form when you raise the whip. Pour over the pudding. Grate the chocolate chips on top and serve. I am a diehard Chocolate Pudding fan, the kind that stands on its own without whipped cream. Additionally, I really love the chocolate film on top of the pudding. If you do not care for the film that forms on top of pudding, cover the Chocolate Pudding with wax paper immediately after transferring to the serving bowl to cool. Remove wax paper before topping with whipped cream and grated chocolate, which you will want to add for a more desirable presentation. I cannot remember the origins of this recipe and my apologies to the food magazine that I adapted it from. 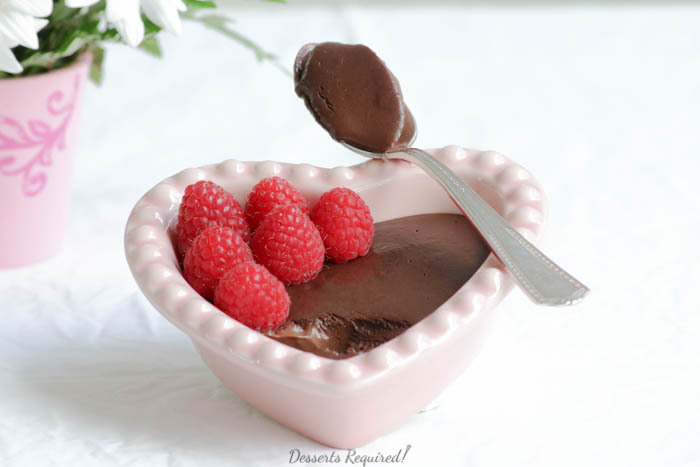 Chocolate Pudding is beautiful when served in a crystal bowl. This is the best chocolate pudding I have ever tasted. I can’t wait to make it myself! Thanks Barbra. 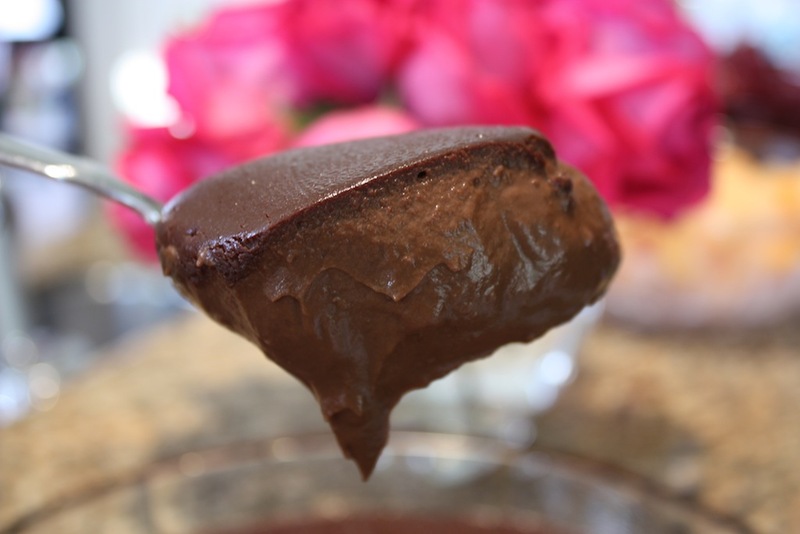 I can’t wait to hear how your family loves the chocolate pudding when you make it. I know it will be fantastic. Decadent… You may bring this back to my house anytime! This is why Dessert is Required! I’ve always taught my girls not to eat chocolate for breakfast. This morning, we broke the rules. KJS, I love this and think chocolate is a must for breakfast, at least some of the time. Love it! This is some serious chocolate pudding with both cocoa *and* chocolate! AND half and half! Swoony! And this pastry chef generally just whisks dry ingredients together (except I do sift my cocoa powder) unless it’s for something super light like a genoise or something. Regular cake gets the whisk treatment though! I am swooning with you! 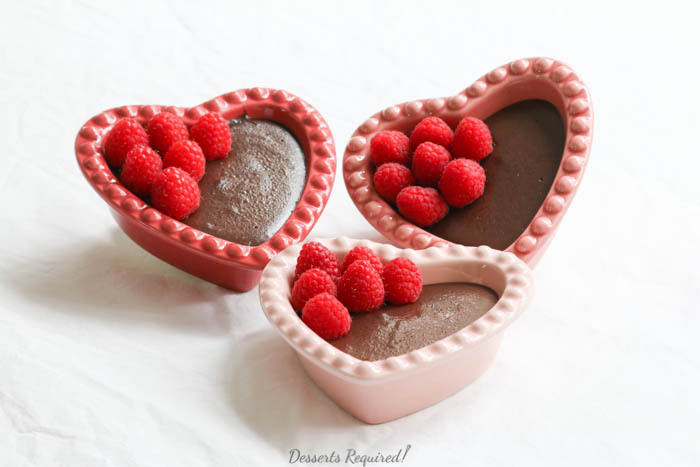 Your pudding looks so rich and decadent and those little heart dishes are darling. 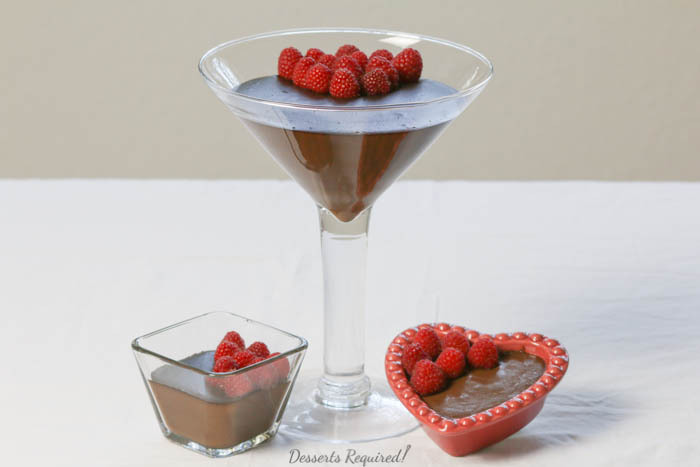 My hubby loves pudding, I’ll have to make this for him! I used to hate sifting too. I guess it doesn’t bother me much anymore. I will have it in the martiini glass, please! Thank you for posting this. I absolutely love chocolate pudding! In fact, I have always wondered how chocolate mousse became the highbrow option. Clearly, chocolate pudding is tastier! Thanks so much. I am with you…creamy chocolate pudding ROCKS!